Tunari Condor trekking 2 days, one night. 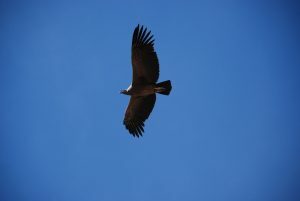 The Tunari condor trekking is one of the most interesting, divers, and less known of Bolivia. It’s a quite easy ascent from the city of Cochabamba, from the starting point near the communities Pairumani and Combuyo. 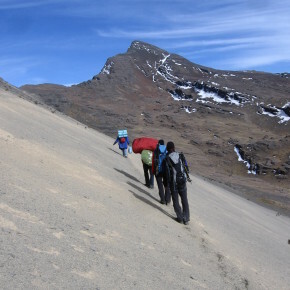 After the maximum guaranty of seeing the Condor – The largest bird on the planet, and symbol of the Andes, the trekking finish with the ascent of the majestic mount Pico Tunari, which with 5035Meters is one of the highest peaks of central Bolivia. 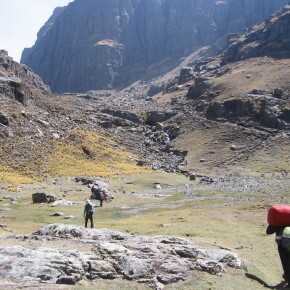 The trekking starts at an altitude of 2.900 meters where the adventurer experience a complete range of differences of ecological zones which exists in the Tunari mountain range, and will enjoy the panoramic views of the Cochabamba valley. Reaching the altitudes we will reach the alpine zone, where awaits us a nice campsite, a place of singular beauty beneath the waters that feed the Cajón lagoon. It’s here were the guides will prepare the diner and were you can appreciate the beautiful environment. The second day whe will cross the massive mountain ridge, coming from the valley, he opens the adventurer a different picture to the northwest mountains with high peaks. Keeping the path of the lamas by the crest, a steep wall of about 500 meters deep provides respectful to the views Pairumani River Basin. 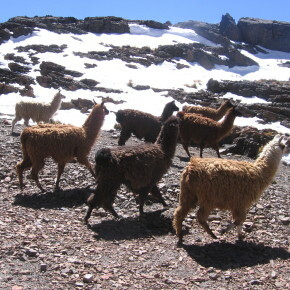 Reaching the final climb of fine rocks, the ascent to Pico Tunari is of little difficulty. We have waiting 2 days for this moment, the summit permits a view over the entire valley, and during days with low clouds we can even admire the high peaks in the Quimza cruz mountain range, the snow caped Cordillera Real in La Paz, and the Mururata and Illimani mountains. Also the view to the north is impressive, with other very high peaks. Its just an unforgettable, impressive and beautiful day in the mountains of Cochabamba. We finish our 2 days trip at 4,600 meters at laguna Macho that lies at the foot of mount Pico Tunari. After a typical lunch awaits us the return to the city of Cochabamba and the valley! This climb is a perfect training for people who wants to train for the Royal and western cordillera.